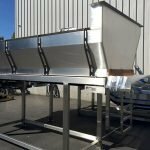 From design to installation, Coastal Manufacturing’s sanitary conveyors are custom engineered solutions for your specific product needs. 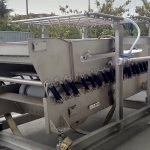 Whether used for produce inspection or sorting beverages, conveyors are created to simplify the product handling process. 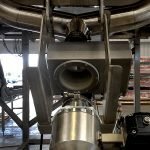 We specialize in conveyors for the food processing industry, including meat, poultry, bakery, produce and pet food. 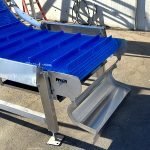 Our conveyors are designed with sanitation in mind, following the specifications of each customer, and are available in any combination of widths, lengths, heights, and belts. 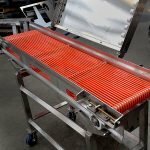 Our engineering team will help you achieve greater efficiency with conveyors that quickly move your product through the processes necessary to get it on the shelves. 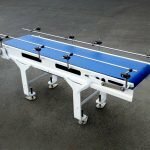 The Coastal Manufacturing team provides cutting edge designs coupled with the newest tools and highest quality workmanship. 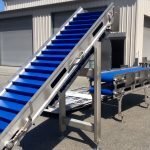 All of our custom conveyors are FDA and USDA approved, and follow FSMA guidelines. 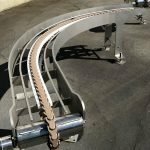 There are a variety of belts available to use with our custom conveyors: sidewall and flexible sidewall belts, monolithic, stainless steel, and one-piece and seamless urethane conveyor belts. 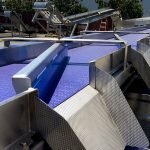 Sanitary belts are ideal for pharmaceuticals and food processing. Plastic modular belts offer an easy-to-clean solution. 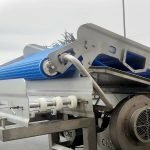 Depending on your application and needs, our experts will work with you to determine the best conveyor belt for your specific product. 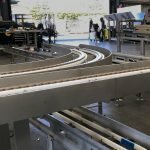 Our team’s creative thinking and strategic approach resulted in a specialized conveyor designed to lift and rotate product in a very small envelope. 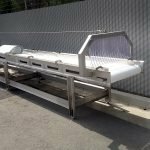 The custom conveyor was manufactured for a USDA meat and poultry inspected plant.